Doctor Who: Primordial Tunes - Mark Ayres | Warped Factor - Words in the Key of Geek. 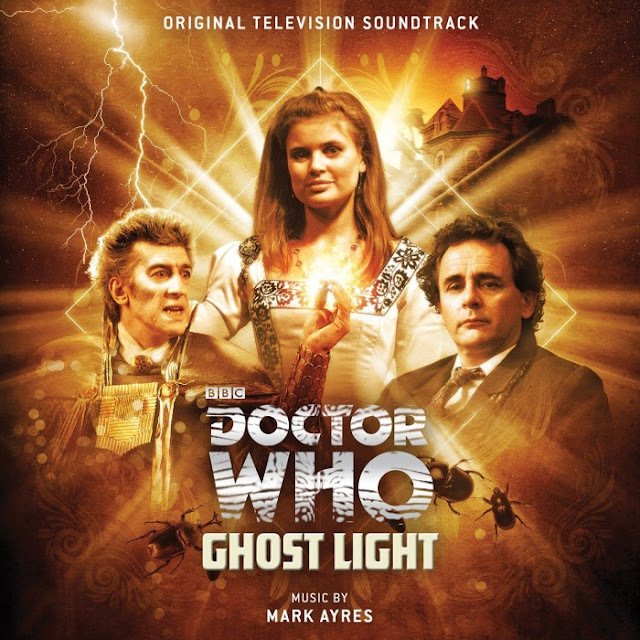 Christopher Morley looks back at the work of another Doctor Who composer. Just what is the purpose of music? Debate has raged for many a year on that point as we've listened & analysed it to death. While we may not yet have a definitive answer on just why our ancestors felt the need to develop a tuneful side - some suggest it was simply an instinctive response by early mankind to natural sounds/phenomena - this Doctor Who composer would follow in the footsteps of Norman Kay in soundtracking a Doctor Who attempt to revisit the prehistoric past. Seven Doctors on from the First's trip to the Stone Age, Mark Ayres would be called in to do the honours on Ghost Light! This was actually the second of only three stories he would work on during Sylvester McCoy's time in the TARDIS, the other two being The Greatest Show In The Galaxy & The Curse Of Fenric. Rather admirably he got the gig the good old fashioned way. Producer John Nathan-Turner would be sent a demo of Mark's own score for Remembrance Of The Daleks, & indeed liked what he heard! Whether Keff McCulloch, the composer of the original score, & indeed the Seventh Doctor's theme, ever clapped ears on it remains unrecorded. A second wind would blow for Ayres with the closure of the Radiophonic Workshop in the mid-Nineties, as he became archivist for the great repository of all things experimental, cataloguing surviving recordings for future reuse. This would come in handy for his work with the Doctor Who Restoration Team around three years after the cancellation of the series. The process of getting some of the early classic episodes of the programme into a fit state once more was not without its difficulties - as he explained while working on a remaster of The War Machines. "There are some difficult decisions as to how far I should take my work. Because the original video has been transferred to film, I've tried to remove anything which was added during the process of optical copying– in other words taking it back to its condition on original transmission. It would be very easy to 'grab' a sound effect, and put it back where it's supposed to be. I haven't done it, because it was wrongly done at the time, and that's the way it should stay. All I've tried to do is correct technical defects which have occurred later with the film, I haven't corrected things which were done wrongly on the original tapes. Except in two places." "...locked in Maida Vale... basically putting labels on boxes. I put together a basic database of what exists. And the deal was that the BBC would give it shelf space, but I would look after it. But it’s not an acquisitioned library and it doesn’t appear on any BBC database or catalogue. I look after it." But it was a labour of love, as was made apparent by his interview with Sound On Sound. "Having messed up the archive, the BBC paid me (not very much, I might add) to sort it all out again." He started with the oldest tapes and worked his way through the pile. When he got up to 1983, all the rest of the tapes were missing. "They'll be the ones that are on DAT," he was told. Pointing out that DAT had not yet been invented in 1983, he set about scouring the building. The tapes, he discovered, should have been put in a skip, but by some fluke the paperwork had not been done — so they must still be in Maida Vale somewhere. "It took a whole week," he says, "of borrowing keys and opening rooms that no-one had been in for years. Eventually I opened a room labelled Band Store and there they all were!" That room was of course the fabled Room Thirteen at BBC Television Centre. And some might unfairly argue their equipment was primitive! Mostly a "lot of old tape recorders and a few pieces of test equipment that could make noises". What noises they were, though. And that initial musique concrete technique as pioneered by the aforementioned Ms Derbyshire & other sonic explorers post-Pierre Schafer, who worked from his own equivalent to the Workshop in the form of the Studio d' Essai de la Radiodiffusion Nationale could be said to link back to the basic principles of prehistoric music itself, in a nice bit of time-looping. "Natural sounds were recorded and manipulated on tape by editing, pitch-changing, and very often by reversing the tape." "The human voice was probably the first musical instrument. In order to obtain a clear rhythm, people used their hands – they clapped or hit two stones with each other. The instruments most frequently found by archaeologists include various types of flutes, whistles and pipes made of wood or animal bones. The oldest findings of such kind in Europe come from the Upper Paleolithic period (50,000 – 10,000 BC)." Ancient Origins has a more practical explanation. "Evolutionary scientists believe that a musical culture would have helped prehistoric human species to survive because the music coordinates emotions, helps important messages to be communicated, motivates people to identify with a group, and motivates individuals to support other group members." "Music has to do with sounds, so we need to find them somewhere and it is preferred to find musical ones. You have two sources for sounds: noises, which always tell you something — a door cracking, a dog barking, the thunder, the storm; and then you have instruments. An instrument tells you, 'la-la-la-la.' Music has to find a passage between noises and instruments. It has to escape.2It has to find a compromise and an evasion at the same time; something that would not be dramatic because that has no interest to us, but something that would be more interesting than sounds like Do-Re-Mi-Fa..."
In other words, just the sort of sounds Ayres helped to save for posterity. Thank you, good sir!